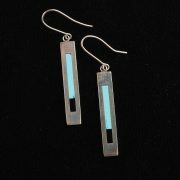 I really love the choice of stone Tim used in these new modern inlay earrings. 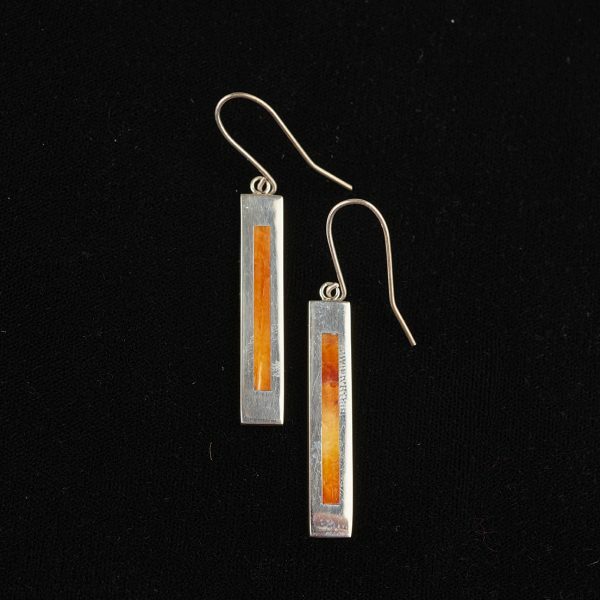 Beautiful orange spiny oyster is set in the sterling silver dangles. 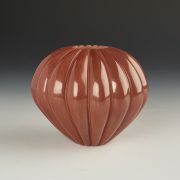 We are thrilled to be showing his newest works. Tim Yazzie was raised in the San Felipe Pueblo in New Mexico. His grandparents were pueblo pottery makers, rug makers and jewelers. Tim’s grandfather was a traditionalist, and a deeply spiritual man. Tim learned valuable things from him about his life and ceremonial events. As a youth, Tim realized his love for art, and recognized his own abilities in jewelry making. He draws all of his designs free hand on the silver and allows the silver and other materials to guide his creative process and develop the ideas that he sees in his mind. Tim creates a lot of overlay designs in his work, but also works inlay techniques to showcase beautiful stones. Using the finest materials, he is now creating new designs, each unique and beautiful, pushing his native pueblo art to new horizons. Tim is hopeful that through his jewelry creations, he will add something meaningful to the future of that legacy.